Short on ingredients and time? Take a look in your pantry! You might surprise yourself with what you can make. These crunchy tuna balls are tasty, unbelievably easy, and packed with protein. You'll only need five simple pantry ingredients to make this simple dish. If we could eat one dish (and only one dish) forever, it would be soup. It's perfect for fall and great for you. This healthy carrot soup can be prepared in under an hour. It uses ingredients that you probably have stocked in your pantry - no need to visit the grocery store. For a bit of extra flavor, substitute some homemade or reduced sodium vegetable stock for the water. Make this healthy carrot soup as an appetizer, or serve it as a meal with whole grain protein banana bread. Peel and dice carrots and onion. Heat oil in pot and sauté carrots with onions for 3 minutes, or until the onion turns translucent. Add water and cover the the pot the water boils. Reduce heat until the soup simmers and cook under a low flame for 20-30 minutes. Stir the soup until it's nice and smooth, then stir in salt, pepper, and curry powder! You're hosting a party and you're running out of healthy snack and dessert options. That's okay. This banana sushi recipe is a crowd-pleaser that can feed a ton of people. It combines classic flavours into one delightfully bite-sized snack. Not only does it accommodate vegetarian and gluten free diets, it's also aesthetically pleasing and tasty. The key is to line the outer ring of each banana slice with a nut butter so that everything sticks together. Use natural peanut butter for the best results (it's better for you too!). Feel free to top this with coconut flakes, a dash of cinnamon, or whatever your heart desires. Cut the banana into small slices and spread the peanut butter all over the sides of each banana slice. 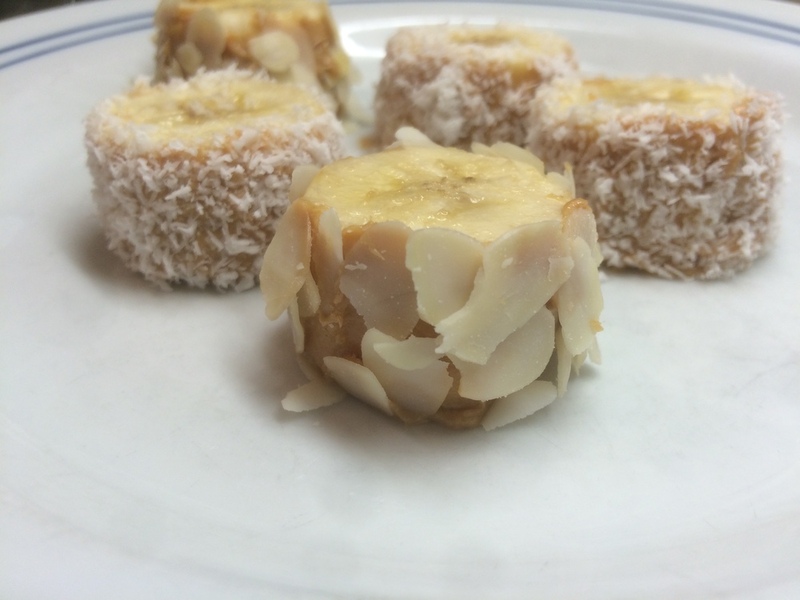 Sprinkle coconut flakes or slivered almonds over the peanut butter layer. Loved learning about these peanut butter banana sushi bites? This was created by PumpUp members @tyler_bacc and @tysa. Let them know if you tried it in the comments below! Sometimes, you want your salad to be more than just lettuce. 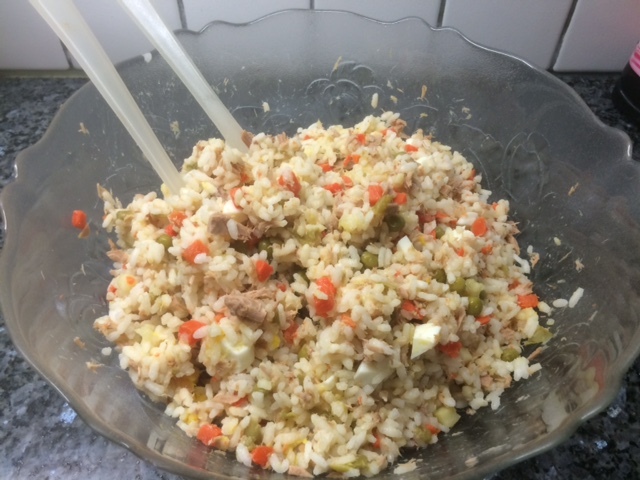 When you finish a workout, there's no better recovery meal than an easy, healthy, and affordable protein-packed rice salad. PumpUp members @tysa and @tyler_bacc made a super-simple salad with ingredients that you can find in your pantry. If you've already prepared a batch rice ahead of time, this recipe will only take mere minutes to assemble. Prep the salad in the morning and make double portions as needed— you'll have this healthy meal at your disposal for the rest of the week! Maximize the fibre content of this recipe by opting for whole-grain rice. Although the recipe calls for peas and chopped carrots, feel free to incorporate any of the vegetables you have on hand. This protein-packed rice salad would be awesome with shaved & roasted brussels sprouts. Cook the rice and let it cool for 10 min. While the rice is cooking, cut vegetables into small pieces and boil them. Blanch vegetables to preserve nutrients and set aside in a large bowl. Dice the hard-boiled eggs into similarly-sized cubes and toss them with the cooked vegetables. Add in the tuna and the rice. Toss salad until all ingredients are fully incorporated. Loved learning about this protein-packed salad recipe? This was created by PumpUp members @tyler_bacc and @tysa. Let them know if you tried it in the comments below! Cut the banana in two long slices. Delicately peel the two pieces apart and spread the strawberry jam (or peanut butter) on the surface of the banana. Put again the banana into its peel. Then decorate it with some low fat whipped cream, strawberries and mini dark chocolate chips. Have a great recipe redux that you want to share with the PumpUp community? Tag your best healthy recipes with #FoodieFriday! Loved this 4 ingredient healthy banana split alternative? Let us know in the comments below! Pin the image below to share it on Pinterest.